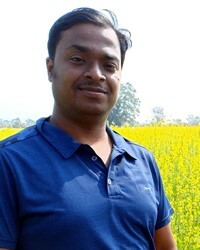 The Tiyar are a group of people who live in India and Bangladesh. Tiyar comes from the word for hunter in Sanskrit. The Tiyar were traditionally hunters in the forests of the ancient Indian subcontinent. With the forests mostly gone, the Tiyar work in the fishing industry and as landless agricultural laborers. Most Tiyar live in rural villages without electricity, access to clean water and indoor plumbing. Illiteracy is a problem among the Tiyar. The Bangladeshi government is working to improve the living conditions of the Tiyar. The primary language of the Tiyar is Bengali. The largest groups of Tiyar live in the Bangladeshi states of Dhaka, Khulna and Rajshahi. Smaller groups live in other Bangladeshi states. 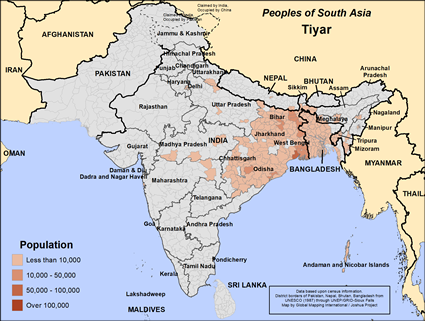 A large population of Tiyar lives in India. The lives of the Tiyar are challenging. When fishing is good they make enough money to feed their families. When fishing is not good, they suffer great need. The landless farm workers are often dependent on the landowners they labor for and the weather. The Tiyar marry within their caste but not within their gotra or clan. They hire Brahmin priests to officiate at their life ceremonies. Families arrange marriages with the newly married couple living near or with the groom's parents. Sons inherit their father's property. Caste associations promote their interests and settle legal disputes. The main foods of the Tiyar are fish, rice, vegetables, fruit and other grains. They do not eat beef, as is the custom of Hindus. The Tiyar practice Hinduism, the ancient religion of India. They worship and serve the gods of the Hindu pantheon. Hindus believe that by performing rituals and good works that they will attain moksha or freedom from the endless cycle of birth, death and rebirth. The Tiyar visit Hindu temples and offer prayers, food, flowers and incense to their gods. Their villages often have their own protector god or goddess. The main yearly holidays of the Tiyar people are Holi, the festival of colors, Diwali, the festival of lights and Navratri, the celebration of autumn. The Tiyar of Bangladesh have pressing needs. They need help in educating their children. They need electricity, clean water and indoor plumbing in their villages. Most of all they need to hear and respond to the life-changing message of Jesus Christ that alone can forgive their sins. * Ask God to send Christian workers to share the good news of Christ with the Tiyar. * Pray for the Holy Spirit to work powerfully through those ministering to the Tiyar people. * Pray the Spirit leads the Tiyar away from Hinduism into knowledge of the Bible and Jesus Christ. en.wikipedia.org/wiki/TiarView Tiyar in all countries.